Kids and adults all can enjoy this fun t-shirt. On this shirt you can see an animal that build some wooden wings and tail fin onto his body and now he is ready to fly. Besides this funny cartoon style picture it also says ” Clear For Take Off”. We show you the design on a t-shirt that has a v-neck and fun stripes on the sleeve but this design is available on more then 100 different styles of clothing for kids and adults. If you are afraid of flying then maybe don’t look at this t-shirt but on the other hand real planes are much safer. 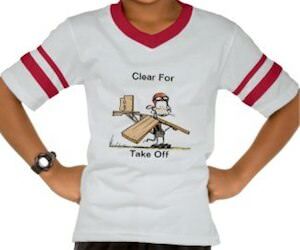 Come take a look at all the options of this Funny Aviation T-Shirt. We all know how it feels when you are in a rush to make that flight. So maybe this t-shirt will help to warn others so that they can stay out of our way. On this t-shirt you can see a paper plane and the words “I Gotta Flight To Catch” and a real plane. The t-shirt is black and with the greens of this print it really looks really neat. 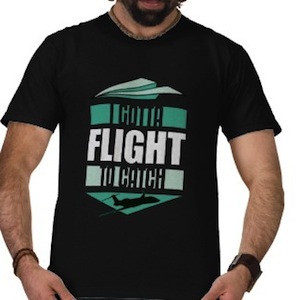 Come check out this I Gotta Flight To Catch T-Shirt.